Franklin Martial Arts is ready to take your fitness and training to the next level. Our professional Jiu-Jitsu staff teach our students the basic up to expert level techniques as they gain confidence, discipline, and self-esteem. Jiu-Jitsu is the premiere on-the-mat Martial Arts, and our program is the best in the Bellingham/Franklin area. We are proud and fortunate to have Professor Bruno Souza, a black belt directly under Roberto Maia, as the main instructor four our Gracie Brazilian Jiu-Jitsu program. Our Brazilian Jiu-Jitsu workouts are geared toward the average person, are very informative, and tons of fun. Bruno Souza and the instructors at Franklin Martial Arts have years of experience in both Brazilian Jiu-Jitsu and teaching. They are dedicated to carefully working with you and helping you achieve your personal goals and develop your personal "Jiu-Jitsu game." Get The Highest Quality Jiu-Jitsu Training At Franklin Martial Arts! At Franklin Martial Arts we will teach you how to escape from the bottom position when you are on the ground and how to use leverage and technique to overcome size and strength to survive a realistic street attack. 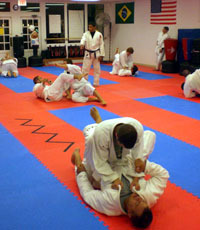 Our Brazilian Jiu-Jitsu classes also specialize in techniques such as chokes, Judo take downs, submissions, and control of an opponent on the ground. You will learn various techniques that will increase your chances of survival in any self defense situation. At the same time you will increase your strength, muscle tone, and flexibility. Fill out the short form on the side of this page to get all the information you need to get started now sent to your inbox.